The Flamingo is the oldest resort on the Las Vegas Strip. It’s got a very interesting history, as it was founded by none other than mobster Bugsy Siegel! Little known fact: there is a Bugsy Siegel memorial plaque located near the outdoor wedding chapel at the Flamingo. Weird. You know what else is outside? Flamingos! They hang out with their friends the ringed teal ducks, brown pelicans and sacred ibises at the Flamingo Wildlife Habitat, which is free and open to the public daily from 8AM-sunset. There used to be penguins at the Wildlife Habitat as well, but they have moved to cushier digs at the Dallas Zoo. The Flamingo truly is an underrated casino and hotel, in our book. They’ve got an old school Vegas theater with swanky booths where Donny and Marie have taken up residency (Olivia Newton John plays on their off nights). There’s a solid adult show called X Burlesque. There are THREE comedy shows, plus a Legends in Concert tribute show. Jimmy Buffet’s restaurant Margaritaville is here, along with a fun spot called Carlos and Charlie’s. All this, and you are right across the street from Caesars Palace, right next door to the High Roller ferris wheel AND you’ve got a monorail stop right behind your hotel! Rooms range from bargain basement $30 rooms to $500+ suites with amazing views and multiple bathrooms. 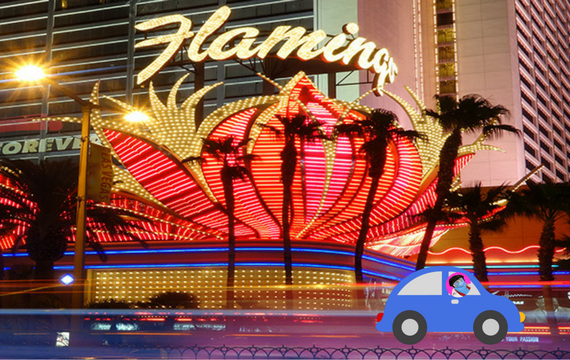 Honestly, the more we talk about it, the more we want to use a Flamingo Las Vegas coupon and stay at this festive jewel in the center of The Strip right now! Hotels Near Flamingo Las Vegas – The Cromwell, The LINQ, Caesars Palace. Flamingo is also a Las Vegas monorail stop. Save With A Flamingo Las Vegas Coupon From Coupon Puppet!